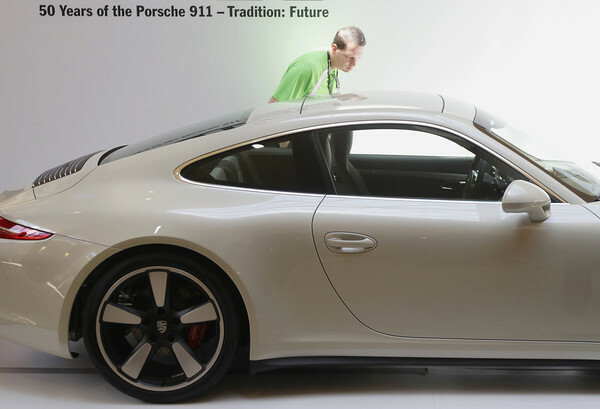 Rich Rocco, of Illinois, looks at a 2014 Porsche 911 50th Anniversary Edition automobile Friday, June 28, 2013 during the 58th annual Porsche Parade at the Grand Traverse Resort and Spa in Acme. The event, of which Rocco is a participant, concludes Saturday. The last time the Porsche Parade (the annual convention for the Porsche Club of America) took place in Traverse City was 1989. A number of Porsche Parade activities have taken place throughout the week including autocross, rally, an art show and a variety of driving tours.